Versa-Tire HD-100 Heavy Duty Tire Repair Kit. Kit contains enough materials to repair up to 80 tire punctures without removing the wheel from vehicle. For use on off road vehicles from giant earthmovers, aggregate, and agricultural. 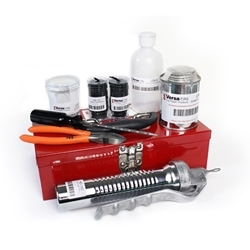 Contents include an adjustable repair material injector tool, 2 repair material refills, bonding compound, leak seeker and applicator bottle, reamer tool, and cut off pliers. Metal storage box included.